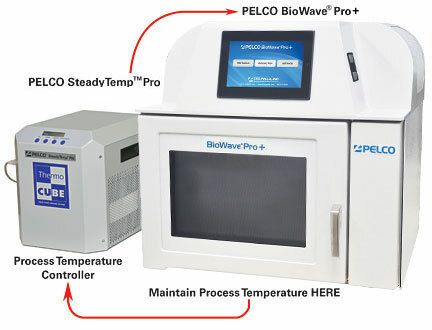 Fully integrates with the PELCO BioWave® Pro+ Microwave System to provide temperature control at the sample level. The PELCO Steady Temp™ Pro is specially designed to work in tandem with the PELCO BioWave® Pro+ microwave system. This chiller provides temperature control at the sample level within the microwave chamber. 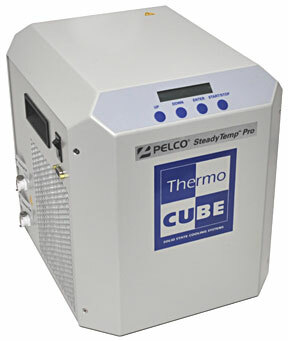 The technology of the PELCO ColdSpot®Pro combined with the PELCO SteadyTemp™ Pro Solid State Chiller offers the unique ability to provide continuous temperature control from 4°C to 80°C. The compact design, fully integrated controls linked to the PELCO BioWave® Pro+ system, and reliable Freon-free technology make the PELCO SteadyTemp™ Pro an essential accessory for any laboratory microwave processing application. 50062 PELCO SteadyTemp™ Pro Solid State Chiller each P.O.R. A non-corrosive algicide for use with constant temperature bath or recirculation chillers like the PELCO SteadyTemp Pro Digital and chillers used for TEM/SEM systems. Chloramine-T algicide prevents the growth of algae which can be damaging to equipment and instrumentation. The product can be used as a shock treatment, or as a preventative treatment at a dosage of 1 gram per gallon. Best to use distilled water to avoid scaling and shield the bath and cooling lines from light.